Home » Food and Nutrition » Diet » Intermittent Fasting: Is It the Right Diet for You? Intermittent fasting—also called IF—is a diet craze that has been growing in popularity in recent years. Although it’s not quite a diet (and more like an eating plan), fasting intermittently may help with weight loss and provide a series of system-wide health benefits. From a weight loss perspective, an intermittent fasting diet probably works as well as any other diet, though it can present some challenges with regard to sustainability. Not eating for an extended period can be rather difficult, especially if you are conditioned to feeding yourself whenever hunger strikes. However, there is no single way to implement an IF eating plan, so it is possible to find a method that works for you. Let’s take a closer look at the many types of intermittent fasting, and potential advantages on both a surface and cellular level. Intermittent fasting refers to a pattern of eating that includes windows of time where you eat, and those where you don’t eat. 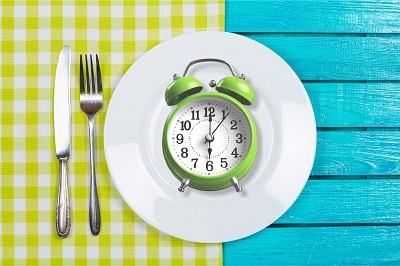 Some forms of intermittent fasting restrict all caloric consumption to a specific time frame each day, such as an eight-hour block, while others include day-long periods where no food is consumed. This type of IF diet might consist of eating dinner on Tuesday night and then fasting until dinner on Wednesday night. Basically, any intermittent fasting program allocates time for eating and time for fasting, with enough variability to meet a number of goals. There are several different ways to try intermittent fasting, but most can be classified into three styles: time-restricted fasting, 24-hour fasting, and alternate-day fasting. Eat-Stop-Eat: This method of IF involves 24-hour fasts once or twice a week. The 5:2 Diet: This method isn’t a fast in the traditional sense of the word, but rather fluctuating calories. On two, non-consecutive days of the week, you would keep your calorie intake to a minimum—within the 500-600 range—while eating normally the other five days. Each method allows you to consume non-caloric drinks like water, coffee, and tea during fasting periods. Just remember not to add any cream, sugar, or milk. Intermittent fasting works by eliminating food intake on specific days, or hours, to stimulate some biological processes. Some of intermittent fasting’s benefits, therefore, are developments you may not immediately notice. The advantage of intermittent fasting seems to come down to this: giving your digestive and endocrine systems a bit of a break. When you’re constantly eating throughout the day—like every few hours from the time you wake up until you go to bed—your digestive and endocrine systems have to keep up. Your digestive system is constantly breaking down food and the bacteria and cells in your body are focused on delivering and utilizing the nutrition; your endocrine system needs to produce insulin to deliver energy to cells. When these taxing processes are not taking place, your body can either get a rest (return to normal insulin production) or focus on other processes (cell maintenance). When it comes to reaping the benefits of intermittent fasting, timing is very important. Human studies thus far indicate that daily intermittent fasts work best and tend to be the most sustainable. These fasts incorporate feeding periods during the day, with longer fasting periods. Generally speaking, the feeding and fasting periods coincide with your natural circadian rhythm (sleep-wake cycle). An example would be having an eight-hour feeding window between 8:00 a.m. and 4:00 p.m., with the fast occurring from 4:00 p.m. to 8:00 a.m.
Studies have shown this method to be effective for weight loss and other potential health benefits. The same cannot be said for every method, however. Studies have demonstrated, for example, that groups implementing full-day fasts every other day saw no weight loss benefits over those who simply ate less every day (when both groups consumed the same number of total calories). Other studies have shown that eight-hour feeding windows produce better results than 12-hour feeding windows as well. A 2018 study, published in Cell Metabolism, examined obese men with prediabetes doing an eight-hour or 12-hour IF regimen. The results showed that while there was no weight loss associated with either IF protocol, the eight-hour group had dramatically lower insulin levels, improved insulin sensitivity, significantly lower blood pressure, and a smaller appetite. The reason for the lack of weight loss (or gain—weights stayed the same) may have had to do with a lack of overall caloric restriction. For any diet to work, there needs to be a caloric deficit. In other words, if you are eating more calories than you burn every day during your feeding window, you will gain weight. Energy from fat cells may be better utilized because you’re not consuming calories for an extended period (if in a caloric deficit). IF may prevent evening snacking, particularly the mindless variety that can occur in the evening in front of the TV. Fasting keeps insulin levels down for an extended period of time. Is IF Better Than Other Diets? Once again, you will only experience weight loss from intermittent fasting if you are eating fewer calories than you burn each day. If you’re in a deficit, you naturally will experience weight loss to some degree. There is some research showing that IF can promote faster and more significant weight loss than other diets, but it is difficult to confirm if this finding is universal. Participants involved in studies from this 2014 review lost four percent to seven percent of their waist circumference, which indicates a significant loss in dangerous visceral fat. Along with calories, paying attention to food quality is also recommended. Fewer calories plus more high-quality foods like lean protein, fish, fruit, vegetables, whole grains, and nuts can offer valuable nutrition to produce health benefits. Although many people look to intermittent fasting for weight loss, its biggest benefits may run much deeper. Going without food for longer stretches can give your body a break from digestion, allowing for a number of processes, including hormone regulation and cell repair, to take place and improve overall health. Research has indicated that IF eating programs can significantly reduce blood sugar, inflammation, blood pressure, and appetite, while boosting insulin sensitivity and gene expression. It’s important to note that many of the observations associated with IF programs are the result of animal tests or lab tests, while current human studies have been small and must be reproduced with larger experiments. This might be one of the biggest benefits of IF. When you don’t eat for a while, your body can start repairing itself and making stored body fat more accessible as an energy source. Lower insulin levels: When blood insulin (a hormone produced in the pancreas) goes down, fat burning for energy increases. More frequent cellular maintenance and repair: During a fasted state, your cells can do a little housekeeping. Much like your brain cells get a clean-up while you sleep, all of your cells get a clean-up when you’re fasting. The cellular repair process includes cell autophagy, where old and dysfunctional protein buildup is removed. Improved gene expression: Fasting also appears to improve how genes express themselves. These changes in function have been shown to protect against disease and promote longevity. Increased Human Growth Hormone (HGH) levels: A fasted state also promotes a greater release of human growth hormone, which can help promote lean muscle mass and fat loss. Insulin resistance is the force behind type 2 diabetes, and IF seems to improve insulin sensitivity. Human studies have shown that IF can reduce fasting blood sugar by up to six percent and fasting insulin resistance up to 31%. Some studies have shown that IF can reduce inflammation and enhance cells’ resistance to oxidative stress. This may have something to do with cell autophagy and gene expression. If further studies confirm its benefits for inflammation, IF may be a worthwhile tool for anti-aging and protection from chronic disease. Human studies have shown IF can lower blood pressure significantly. There is also research indicating it may reduce “bad” LDL cholesterol and total triglycerides. Combined with its influence on blood sugar and insulin resistance, IF could be a useful tool to prevent heart disease. If you have a history of eating disorders or a poor relationship with food, intermittent fasting is not recommended for any reason. People who are very underweight or currently battling bulimia or anorexia should avoid IF or talk to their doctor first. In these cases, an IF diet may be very harmful. Studies have shown that women seem to react differently to IF than men. Women do not appear to experience the same benefits as men, and one study showed IF can actually worsen blood sugar control in women. There is also anecdotal evidence that IF can interfere with women’s menstrual cycles, which were normalized after switching back to regular eating habits. Women may want be a little more careful with IF and explore other dieting techniques. Hunger and adjusting to a new routine will be the main side effects of an IF protocol. In the early stages, you may experience some mental fog or frustration, but it should pass as you become accustomed to the new routine. Existing medical conditions can also add some risk, so if you have one, consult your doctor about IF beforehand. These specific instances aside, IF is considered very safe. Before you give intermittent fasting a try, talk with your doctor. The IF trend may work better for some groups than others. But those who are suited for the diet may experience systematic health benefits alongside their slimmer waistline. Tello, M., “Intermittent Fasting: Surprising Update” Harvard Medical School, June 29, 2018; https://www.health.harvard.edu/blog/intermittent-fasting-surprising-update-2018062914156, last accessed April 12, 2019. Gunnars, K., “Intermittent Fasting 101 — The Ultimate Beginner’s Guide” Healthline, July 25, 2018; https://www.healthline.com/nutrition/intermittent-fasting-guide, last accessed April 12, 2019. Sutton, E., et al., “Early Time-Restricted Feeding Improves Insulin Sensitivity, Blood Pressure, and Oxidative Stress Even without Weight Loss in Men with Prediabetes,” Cell Metabolism, June 2018; 27(6): 1212-1221.e3; https://www.sciencedirect.com/science/article/pii/S1550413118302535, last accessed April 12, 2019. Barnosky, A., et al., “Intermittent fasting vs daily calorie restriction for type 2 diabetes prevention: a review of human findings,” Translational Research, Oct. 2014; 164(4): 302-311; https://www.sciencedirect.com/science/article/pii/S193152441400200X, last accessed April 12, 2019. Heilbronn, L., et al., “Alternate-day fasting in nonobese subjects: effects on body weight, body composition, and energy metabolism,” The American Journal of Clinical Nutrition, Jan. 2005; 81(1):69-73; https://www.ncbi.nlm.nih.gov/pubmed/15640462, last accessed April 12, 2019. Johnson, J., et al., “Alternate day calorie restriction improves clinical findings and reduces markers of oxidative stress and inflammation in overweight adults with moderate asthma,” Free Radical Biology & Medicine, Mar. 2007; 42(5):665-74; https://www.ncbi.nlm.nih.gov/pubmed/17291990/, last accessed April 12, 2019.